Spread butter all over the inside of the dutch oven. In a bowl, beat eggs, milk, dry mustard, and salt. 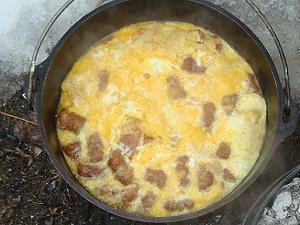 Layer the bread, sausage, and eggs into the dutch oven. Cover and Bake at 350 degrees for 20-25 minutes. Pour cheese over top of casserole. Bake another 10-15 minutes until cheese forms a light-brown crust on top of cooked eggs. 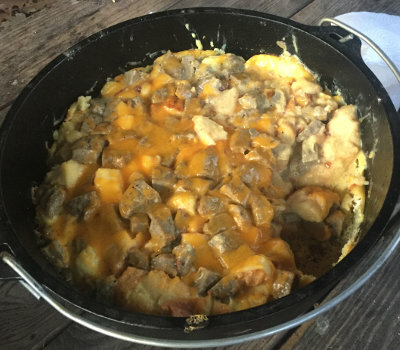 Let me know how you enjoyed your Breakfast Casserole! Cook time is way off! @Brandon - Do you feel it is too much or not enough time? It's worked for me many times at these times. Cook time stated is too little. I followed the proportions/dutch oven size exactly, and it's been in the oven at 350 degrees for 40+ minutes now. Still far from solidified. An entire quart of milk has me worried that this will set. Thoughts? I made this recipe again this morning to check if the amounts or times need tweaking. Here are my results - fully cooked and firm. The bread soaked up the eggs fine and then cooked. You could use 3 cups of milk instead of 4, and I bet it would be just fine.